Roma Food – a feast for the eyes and the palate in Berlin. «Living in Berlin I missed Italian soft meatballs – polpette – cooked in succulent tomato sauce, with authentic olive oil. Homemade, delicious food “grandma style”. A little while after I opened my stand of street food I decided to have the meatballs on the menu as a regular and ended up turning them into my trademark so to speak. Needless to say, good, quality pasta was always our main dish otherwise onedoes not last from dusk to dawn». 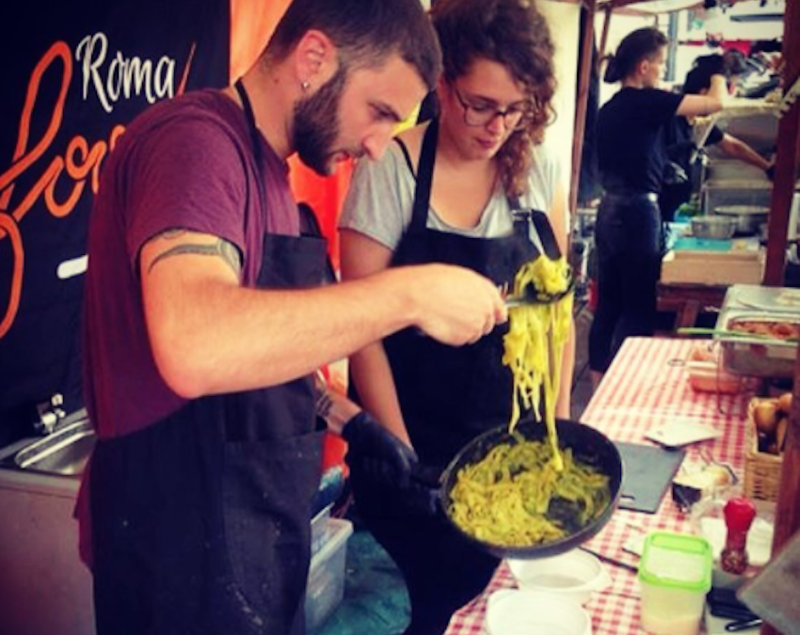 Gianluca De Rosa, who spent his youth between the two districts of Garbatella and Roma70, is the founder of Roma Food, meeting point for those who love pasta and meat dishes in Berlin and can be found every Sunday at the Mauerpark and Wednesday at the Ökomarkt am Nordbahnhof. «I started in April 2016 and have had lot of satisfaction since. Not too bad considering that I came here to study». Read this article in Italian or German. Rome to Berlin to stay…for now. «I am not ruling out going back to Italy in the future. I love Rome. However, right now the economic situation in Italy does not allow me to go back and I don’t see any improvement in the long term». Gianluca arrived in Berlin to further his studies. «After a three-year degree in Political Sciences I decided to do a master in English in Germany but there aren’t many universities here where one can study in English so I decided to give myself some time to study German before sending my application. I am used to doing things on my own since I was 13. I’ve had all sorts of jobs: gastronomy, sales, labourer, schools’ cross country running organiser and while I was waiting to join a university I worked in the gastronomy sector here in Berlin to make a living. It was a good training ground as they say, with good and bad experiences with people from different nationalities including Italians. I am passionate about serving good food and making people feeling good with good food and don’t like having anyone above me who doesn’t share my passion and attention for quality or the rights of those working for them. I had a lawsuit with a Swiss woman and won though I didn’t have the support of a solicitor». Nowadays Gianluca, and at least a dozen young Italians who manage a stand of Italian street food in Berlin, is not concerned about offering only good quality Italian street food but also to offer food as a cultural experience. «Quality Italian food is a passport to positively spread Italian culture». What’s on the menu at Roma Food. «We always make sure we have either the ragù or the amatriciana. The ragù is a mix of minced beef or veal with fresh ricotta cheese because that’s how we do it back home. I serve the food I first enjoy eating. Pasta with basil pesto and zucchini is always on and it is served without parmesan cheese which can be added later on by those who prefer so that we can cater for vegans as well. The variety of pasta we use is bronze-cut and produced by artisanal pasta maker Leonardo Carassai in Campo Filone from Marche, a well known area where quality pasta is produced and exported all over the world. High quality pasta has a cost though! But, we do our best and people keep coming back appreciating our products. Panini are also a constant on our menu filled with the same meat we use for our ragù but not minced». Roma Food – Future and Italy. «Our aim in the future is to carry on with our activity and start distributing pasta produced by Leonardo Carassai and other products from Italy in Berlin. The restaurant Malafemmina is already one of our clients and we hope to expand soon. Time and patience are essential to succeed and there are a few who are willing to invest in quality». We ask Gianluca a question: why not to set up a similar business in Italy? «Well, let’s be honest, here there is not a culture of home cooking similar to the one we have in Italy and therefore people are more used to eating out. Besides, here is easier to get a permit to open a new business and taxation is not as high. And, if the new business is not well established yet they tend to give more tax cuts to make sure it stays afloat. Why am I using Roma in my chosen business name? My closest friends used to call our group “Roma Sud” (Rome South) and I wanted to pay homage to it and to my Italian roots. It gives me strong foundations in reminding myself where I come from and where I want to go, here in Berlin and anywhere else».